'Amico(1904-1987) searched for ways to make art education a force that would enrich people's lives. The humanistic sensitivity began as the experience of perceiving colors and forms, light and refliection. Surprise and joy form tactile, visual, and physical sensations are transformed into a zest for living. This excitement is for children the beginning of strong emotional attachments to people and things. Color Fountain　drawing　The toy consists of a wooden base with tall fountain streams of paper arising and curving out of it. The top of the base is provided with four wooden keys on four sides. While one key permanently reflects an aura of light around the founatina, the other three when pressed, emit three when pressed, emit three different colors. The 'fountain streams' in the center are fitted to revolve and convey the effect of a moving color fountain. Nature Texture Machine　drawing　This device allows children to explore natural textures. Samlpes of cat fur,snake skin, bird feathers, and tree bark are mounted on a push-button operated rotating panel. As each texture moves into a position where it can be touched, a picture of the animal, bird, or object appears in a lighted window alondside it. Automatic Tactile Scale　drawing　This machine, based on one of the Bauhaus exercises and an extention of the Natural texture Machine, is composed of four moving bands, set side by side, of different textured materials mounted on motor-driven spools, The first has a variety of soft materials; the second, hard; the third, smooth; and the fourth rough. When children operate each motor, they can feel the different textures as they pass under his fingers, When they stop the motors, they are able to feel a conbination of textures, The experience helps to sensitize them to the textural quality of materials with which they are already familiar. Pattern Study Machine　drawing　Numerous patterns of nature, mounted in a lighted box, are displayed for children's close examination, By operating two mobile magnifying glasses over patterns, such as wood and grain, photographs of outer space and the moon's surface, printed textiles, woven fabrics, paintings in mixed media, graphic prints, etc,. children can discover the quality and richness of detail and sharpen ther powers of observation. Color Experiment Machine　drawing　Two additional fundamentals of color are explored in this machine: intensity and value. The children can discover the effect of color intensity by dimming or brightening different colors. Three circular panels of colored plexiglass are arranged above each other, each of which is raised or lowered in intensity by operating a rheostat altering the amount of projected jight. The children can compare the three by changing the strength of each and can discover their relative effect. Value is demonstrated by a large panel separated in bands of different colors. Another panel, arranged in squares of values from high light to dark, slides in front of the colors, demonstrating how each color is altered when its value is changed. Electoric Light-Sound Color Organ　drawing drawing　This electoric organ containing a keyboard, microphone, and lighted panel is prominently situated in the orientation area. As the children speaks or sings into the microphone or plays the organ, the sound is translated into patterns of color on the lighted screen. The patterns differ according to the timbre, pitch, and volume of the children's voice. Neon-Strobe Environment Booth　drawing　A booth containing a flashing strobe-light which lined with mirrors, fragments, distorts, and reflects true images. By pressing different switches, the children can change the color and character of the envionment. String Picture Makers　drawing drawing drawing　A complex and chalenging teaching machine based on the simple String Design described avove, involves spontaneous creation in line, color, and shadow. Elastic strings are stretched against a lighted background, while spotlights project color on the string arrangement from different angles. The design becomes repeated automatically a number of times and double images and color harmonies are producted by the projected colors. Color Player　drawing　Although it appears to be simlar to the electronic Light-sound Organ, the color player is completely different in concept and operation. It has a keyboard and a lighted panel above it, but the children raise the panel like a double-hung window and hangs different geometric shapes, free forms, or figurative shapes on two structures mounted on turntable. By depressing the player's two foot pedals, the turnables are set in motion. The piano-like keys operate color spotlights, projecting the patterns on the lighted window. Mobiles　drawing　A void with a suspended skeletal structure provides an opportunity for the children to improvise their own mobile design by hanging various shapes and materials on the hanging Tree. The background of the model is faced with mirrors. When the children finish their arrangement, they can light the mobile and start a turntable going. The result is a myriad of reflected images of infinite variety and excitement. Human Figure(Form & Space)　drawing　The model is equipped with black, white, and colored spotlihts, as well as with a strobe-light for psychedelic effects. A turntable in the center provides for atudying objects form different angles. Switches control each light. 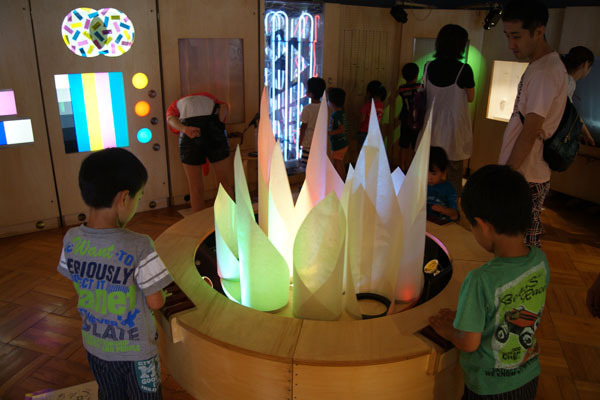 The children are able to place objects on the turntable and observe both the effect of light on form and the shadow cast by it. They can observe actual form and the distortion of it produced by light direction . Stage Design　drawing　Children can observe dramatic and environmental effects produced by light and form as they relate to scale. They can explore front, back, and directional light, in black and white and in color. The stage is arranged in abstract forms to suggest architectural structures. This exercise can be one of personal experimentation or planned creative compositions for play and dramatizations to be acted out. The concept of scale is the aesthetic element emphasized here. Infinite Mirror Reflector　drawing　It reflects back an infinite number of images. In the centere is a wooden trunk with holes. The child can insert small wooden brances laden with tinsels, feathers and other shining decorations, into these holes. By pressing a button, the decoration laden trunk revoles throwing back several reflections. The concept of perception, is learned by visual component, tactile component, audio component. Sensual surprise and pleasure, to change the interest in it to live. Excited maind is the beginning of attachment to human beings and things.